Ever wondered which apps are using your cellular data allowance the most? A new app from Onavo has the answers. Onavo has developed a reputation for doing smart things with mobile data, whether it’s helping you save money or keeping you informed about what’s eating up your allowance. While Onavo Count has been available on Android for some time now, today it launches on iOS and if you have restrictive cellular data package, you’re going to want this app. 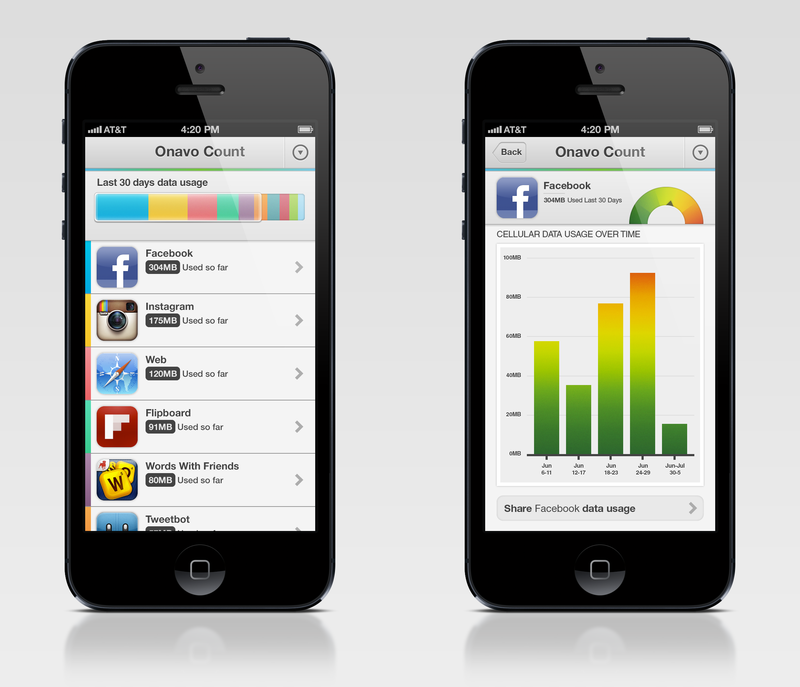 Unlike other data counter apps which just show overall data usage, Onavo Count gives you a list of how much data each individual app is using, complete with charts that show how that changes over time. Trying it out, I was shocked to see just how much of my data plan I used in a single day. Admittedly, I did download a couple of app updates over 3G, but it’s fascinating to see not only the biggest data hogs (Mail and Mobile Safari for me) but also how much data those apps that run in the background, like Highlight, use. The answer’s probably ‘not a lot’ but it’s good to know, so you can get rid of any gross offenders. Onavo Count for iOS misses out on some of the bells and whistles that its Android counterpart enjoys – most notably the homescreen widgets that offer real-time updates on data consumption. However, we can hardly blame Onavo for the restrictions imposed by the operating system. Onavo Count makes for a useful accompaniment to the startup’s other, ‘data shrinking’ app, Onavo Extend, which it launched at The Next Web Conference in 2011. Extend runs your mobile data through Onavo’s servers, compressing it to help you save money. Founded in Israel, Onavo is currently focused on increasing the distribution of its apps. CEO Guy Rosen tells us that the team has expanded, with an office recently opened in San Francisco, where he is now based. Onavo Count for iOS is free and available now.